Join us on Friday night at 6:15 PM for a Family Night of Worship at Resurrection Life Church! Dinner will begin at 6:15. 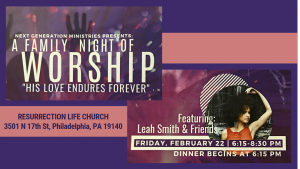 Following will be a worship night with Leah Smith & Friends.